India-focused music streaming service Saavn has introduced its paid-for premium features to Android devices after it updated its Android app. The launch brings Android up to par with its iOS offering, which got Pro support in March. Saavn Pro, which takes its cue from Spotify and others, provides offline access to music and higher quality streaming (songs play at 320kbps) for a set monthly fee. In addition, access to Saavn’s catalog of over 1.1 million songs is ad-free across all platforms for Pro subscribers. The service will sync offline tracks via WiFi or cellular connectivity, and there is also the cheaper option of Saavn Pro Lite, an India-only service that lets users cache up to 1 GB of music on a single device for INR 110 ($1.85) per month. That’s less than Saavn Pro users, who can store up to 3 GB of music across as many as five devices, but the cheaper price-point is aimed at kick starting the nascent music streaming industry in the country. Rishi Malhotra, Saavn’s New York-based President and COO, told TNW that the introduction of the Pro service on Android is “very important”. Calling Android “India’s smartphone” — because adoption of Android devices far outweighs that of iOS in the country — he estimates that between 60 and 70 percent of the service’s users in India which makes it a key opportunity for the paid-for service. In addition to reaching more users, Malhotra cities Google’s local pricing as a notable factor since it allows the company to vary the cost of Saavn Pro worldwide. The service will be available to international users for $3.99 per month, but Android owners in India will pay just $1.99 per month. Despite the popularity of Android in India, Saavn’s global reach is reflected in the fact that iOS is the “biggest proxy” of its near 10 million monthly active users, according to Malhotra. 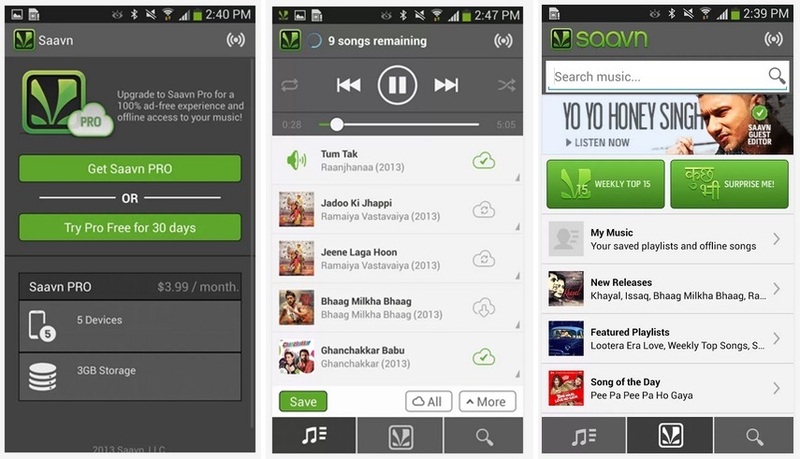 Saavn is one of the three major Bollywood-focused music streaming services that includes a mobile version, and it becomes the second to launch an ad-free option for Android. Dhingana’s premium service for iOS launched this month at a cost of $1.99 per month, while Gaana brought its Gaana+ service — which costs $2.99 per month in India and $3.99 per month worldwide — to Android in June. Founded in 2006 initially as a B2B service, Saavn was relaunched as a consumer-focused streaming site in 2009 and went on to close a $6 million investment round later that year.